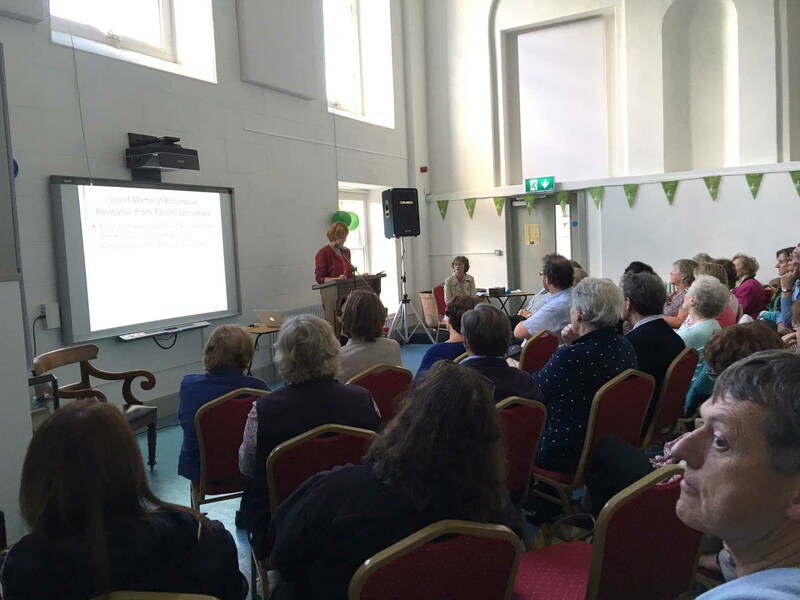 It was great to see so many in the Courthouse – some 70 people – on Thursday 25th August for a most interesting and informative talk on Violet Martin the youngest of sixteen children of James Martin of Ross. Dr Julie Anne Stevens Lecturer in the School of English, St. Patrick’s Campus, Dublin City University, gave us a great insight into the life and work of Martin Ross. Violet Martin and Edith Somerville were second cousins, and originally met on January 17, 1886 at Castletownsend in West Cork, after which they became lifelong companions and literary partners. They came to share a home in Drishane, County Cork and, in 1889, Violet adopted the pseudonym “Martin Ross”, which comprised her surname and the name of her ancestral home (now Ross Castle); thus the authors were called Somerville and Ross. Their works include The Real Charlotte (1889), Through Connemara in a Governess’s Cart (1892), In The Vine Country (1893), Some Experiences of an Irish R. M. (1899) and The Silver Fox (1897), detailing much of the impact on the local area of the Galway Clifden Railway which opened in 1895. We also heard how Violet’s west of Ireland background connected her to prominent figures in Irish literature such as Lady Gregory, Oscar Wilde and George Moore. We thank Dr Julie Anne Stevens for making the trip from Dublin and she was pleased to see the last resting place of Violet’s older brother, Robert Jasper Martin (“Ballyhooley Bob”) who was also a noted journalist, songwriter, musician and singer one of whose best known compositions is “Killaloe” which was adopted as the marching tune of the Connaught Rangers. 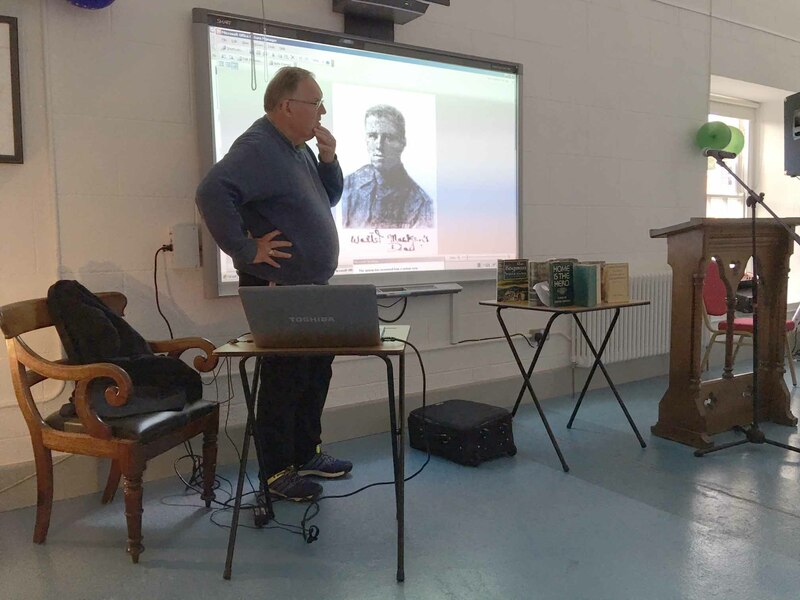 On Friday evening, Ultan Macken returned to give a fascinating account of his father’s work as playwright, actor, producer, theatre manager. We heard how, having accidentally fallen into acting at 16 years of age following a casual conversation with somebody on the Salmon Weir Bridge, he went on to become the Taibhdhearc’s leading actor. It was there that he met Peggy Kenny who was to become his wife in 1937. After spending two years in London he returned to take up the position of Director at the Taibhdhearc and from 1939 to 1947 he was responsible for 77 productions either written or translated by himself while, at the same time, designing erecting and painting the sets. He later worked with the Abbey Theatre in Dublin and acting trips to New York in 1951 and 1952 led to lucrative offers for screen-writing and acting which were turned down in order to concentrate on his writing – his preference at that time expressed in the phrase “I lust for the theatre but I love my writing”. Walter Macken lived with his family at Gort na Ganiv from 1951 to 1966 and, having moved to Menlo, he died suddenly eight months later on 22nd April 1967.